Warrenpoint Town are targeting victory over Glentoran on Saturday to chalk up a third straight win and boost hopes of avoiding Premiership relegation. The Milltown team remain bottom but have closed the gap on 11th-placed Carrick Rangers to just three points. "We feel we can stay up but it's a matter of small steps," said Town manager Barry Gray. "It's another tough game. 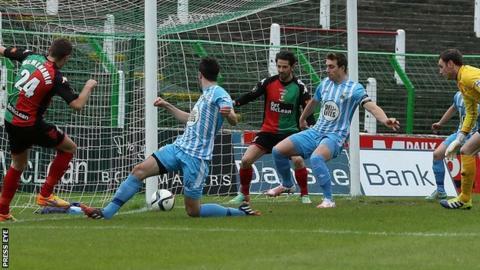 Glentoran have been hot and cold - you do not know what to expect from them." Warrenpoint secured just their second league win of the season by beating Coleraine last Saturday and followed it up with a 2-0 victory over Portadown on Tuesday night. Gray added: "We have to recover from the two games close together. There are no injuries of note so we want to be able to field a consistent team. "It is good to see the bounce in the players after the recent results. They have waited a long time to get some wins and it has pulled us close to the teams above us. "It is nice but we cannot get carried away." Carrick's defeat by Ballymena United in midweek left them with just one win in their last 14 league outings. However, Gary Haveron's side have played three fewer games than Warrenpoint as they prepare to host Coleraine. Ballinamallard United are only a point ahead of Carrick and the Fermanagh side face Cliftonville at Solitude. There will added spice to the clash between Portadown and leaders Crusaders at Shamrock Park. Ports midfielder Michael Gault has agreed a summer move to the champions and he is expected to play against his future club. Stephen Fallon could make his Linfield debut against Ballymena after his loan signing from Swansea City. Blues pair Paul Smyth and Jamie Mulgrew have signed new deals with the Windsor Park club and they are likely to feature at the Showgrounds. Glenavon fought back from two goal down to draw 3-3 with Cliftonville last Saturday and the Lurgan Blues make the trip to Dungannon Swifts.